Established in memory of Basil Stuart-Stubbs, the annual Basil Stuart-Stubbs Prize for Outstanding Book on British Columbia recognizes the best scholarly book published on a British Columbia subject by a Canadian author. This prize was established in 2012 to honour the memory of Basil Stuart-Stubbs, whose many accomplishments included serving as the University Librarian at UBC Library and the Director of UBC’s School of Library, Archival and Information Studies. The prize is administered by UBC Library and the Pacific BookWorld News Society. If you wish to honour Basil’s memory and support the award, please click here for more information. Dr. Daniel Marshall, Claiming the land: British Columbia and the making of a new El Dorado . Ronsdale Press. 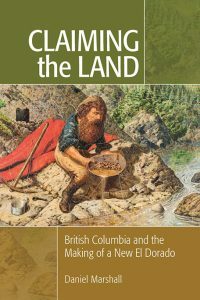 Published by Rondsale Press, Marshall’s book is a carefully researched narrative of the 1858 Fraser River Valley gold rush that enriches our understanding of that pivotal period in British Columbia and the geopolitical forces at play. 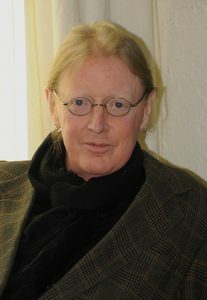 Dr. Daniel Marshall is an adjunct assistant professor at the University of Victoria. He is also the author of Those Who Fell from the Sky: A History of the Cowichan Peoples, which received a BC2000 Millennium Award. Dr. Marshall serves as a Special Advisor on gold rushes to the Royal BC Museum. Solen Roth, Incorporating Culture: how Indigenous People are Reshaping the Northwest Coast Art Industry. UBC Press. Rick James, Don’t Never Tell Nobody Nothin’ No How: the Real Story of West Coast Rum Running. Harbour Publishing. For the latest information about the prize, visit the Library’s news page. For pictures of the winners, the annual reception or other media, visit the Library’s Flickr page. Dr. Marianne Ignace and Chief Ronald E. Ignace, A Secwépemc People, Land, and Laws: Yerí7 re Stsq’ey’s-kucw. McGill-Queen’s University Press, 2017. 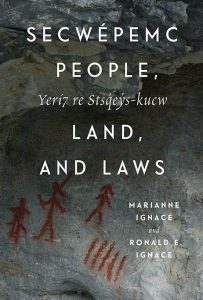 Published by McGill-Queen’s University Press, the book is a model of collaborative approaches to Indigenous history. Drawing on Aboriginal sources and the work of outside experts, it masterfully integrates oral histories and ‘western’ scholarship. Dr. Marianne Boelscher Ignace is a professor of linguistics and First Nations studies at Simon Fraser University. Chief Ronald E. Ignace is a Secwépemc historian, storyteller, and politician, and adjunct professor at Simon Fraser University. Richard J. Hebda, Sheila Greer, and Alexander Mackie, editors. Kwädąy Dän Ts’ìnchį: Teachings from Long Ago Person Found. Royal BC Museum Press, 2017. Jonathan Peyton, Unbuilt Environments: Tracing Postwar Development in Northwest British Columbia. UBC Press, 2017. 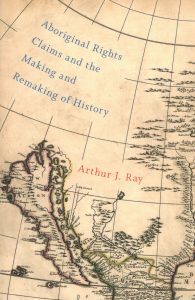 Winner: Aboriginal Rights Claims and the Making and Remaking of History by Arthur J. Ray. Montreal and Kingston: McGill-Queen’s University Press, 2016. This authoritative, masterfully-written examination of land claims litigation between indigenous peoples and the settler societies of the United States, Canada, Australia, New Zealand, and South Africa powerfully demonstrates the important role proceedings in British Columbia played in events of global significance. Ray points out the critical place court processes in the province had in the validation of oral evidence as a viable form of proof and authentication. He traces the development of protocols that help ascertain pre-contact territorial boundaries and allow the character and extent of pre-contact resource use to be understood and recognized. Ray shows us how these processes contribute to an enrichment of judicial, political, and scholarly activity around the world. This book models the fashion in which occurrences in particular societies can be seen to have general importance and wide impact. Yakuglas’ Legacy: The Art and Times of Charlie James by Ronald W. Hawker. Toronto: University of Toronto Press, 2016. At Sea with the Marine Birds of the Raincoast by Caroline Fox. Calgary and Victoria: Rocky Mountain Books, 2016. 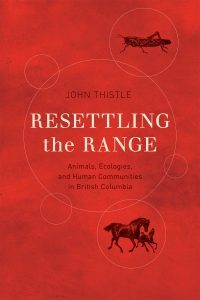 Winner: Resettling the Range: Animals, Ecologies, and Human Communities in British Columbia by John Thistle. Vancouver: UBC Press, 2015. The British Columbia interior, particularly its grasslands, has not received the attention its historical importance merits. John Thistle’s innovative study paints a graphic, compelling picture of the occupation of the Cariboo-Chilcotin region by newcomers, mainly ranchers. Their imperatives, which their economic and political authority allowed them to enforce, particularly in respect to wild horses and grasshoppers, profoundly altered the ecological balance of the grasslands, often to the detriment of the indigenous peoples living there. This well constructed, clearly written, and persuasive book makes an important contribution to our understanding of an overlooked aspect of British Columbia’s past. Working Mothers and the Child Care Dilemma: A History of British Columbia’s Social Policy by Lisa Pasolli. UBC Press. Made in British Columbia: Eight Ways of Making Culture by Maria Tippett. Harbour Publishing. 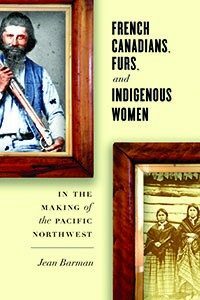 Winner: French Canadians, Furs, and Indigenous Women in the Making of the Pacific Northwest by Jean Barman. Vancouver, BC: UBC Press. Centering on the French Canadian presence in the Pacific Coast’s post-contact, fur trade-based life, paying detailed attention to the fashion in which that presence was strengthened and sustained by connections with indigenous women and the family formations those connections produced, and placing strong stress on the Pacific Northwest’s pre-international boundary context in which these interrelationships took form. Strongly grounded in little-consulted archival sources, possessing a critically important orientation towards both individual histories and the history of groups, and marked by an incisive orchestration of its notation and themes, it stands as a major transmitter of new information as well as a powerfully-structured agent of new ways of seeing the significance of the French Canadians in the making of British Columbia. The Sea Among Us: the Amazing Strait of Georgia. Richard Beamish and Gordon Macfarlane, editors. Harbour Publishing, 2014. Ancient Pathways, Ancestral Knowledge: Ethnohistory and the Ecological Wisdom of Indigenous Peoples of Northwestern North America by Nancy J. Turner. McGill-Queen’s University Press, 2014. 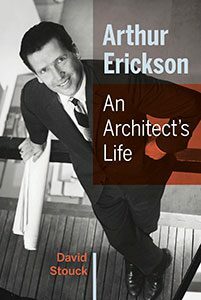 Winner: Arthur Erickson: An Architect’s Life by David Stouck. Douglas & McIntyre. Arthur Erickson’s life was a saga of contrasts and contradictions. An architect of international reputation, he was “Canada’s national treasure as a designer” who, at the height of his career, went spectacularly bankrupt despite lavish financial support from his admirers. He was a creator and, for new buildings, “his proposal [was] always more than you anticipated,” but he could not be bothered with either the mechanics of construction (such as leaking roofs), the mundane administration of an office, or financial restraint. Erickson partied with the international jet set but spent much time alone in a converted garage in Vancouver. David Stouck’s study, based on exhaustive research, details in well-written prose the manifold contrasts and contradictions. While some may question Stouck’s restraint in passing judgment, others will appreciate the author’s success in maintaining respect and even affection for Erickson despite the damning evidence that is presented. Charles Edenshaw by Robin Kathleen Wright, Daina Augaitis, Robert Davidson and James Hart. Black Dog Publishing. Inventing Stanley Park: An Environmental History by Sean Kheraj. Vancouver, BC: UBC Press. 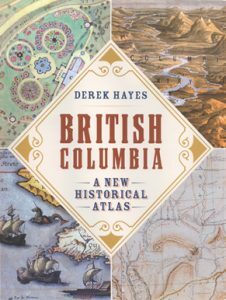 Winner: British Columbia: A New Historical Atlas by Derek Hayes. Vancouver BC: Douglas & McIntyre. Print is often considered to be the indispensable means of conveying knowledge and understanding, but images are an equally effective if underappreciated way of doing so. Maps can be said to combine the best of visual and print, conveying the reality of both our current surroundings and those existing before we were born. Derek Hayes employs a wide range of maps, photographs, prints and drawings to take us into the sometimes vanished worlds of British Columbia from pre-contact through the 20th century. Often in colour and always arresting, the images are explained and placed in context by textual annotations and an intervening text. Hayes makes a welcome contribution to our understanding of the nature and the development of our province. Journey with No Maps: A Life of P.K. Page by Sandra Djwa. Montreal & Kingston: McGill-Queen’s University Press. Father August Brabant: Saviour or Scourge? by Jim McDowell. Vancouver BC: Ronsdale Press. Photo courtesy of University Archives. and Director of the School of Library, Archival and Information Studies (SLAIS) from 1981 to 1992.
participating in the establishment of the scholarly journal Canadian Literature (he was the first Circulation Manager). 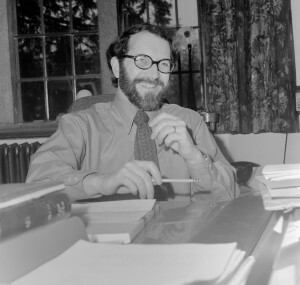 Basil Frederick Stuart-Stubbs, the eighth University Librarian at UBC, passed away on May 29, 2012. He was 82. After his passing, many tributes were published, including “Basil Frederick Stuart-Stubbs: bibliophile, scholar, librarian” by UBC Library, “He made books and writers a priority” in the Globe and Mail, “Basil Stuart-Stubbs: 1930-2012″ in Quill & Quire and “Remembering Basil Stuart-Stubbs” in ABC Bookworld.